When we released QR Droid on December 8th, 2010, we hoped that someday it would become one of the most downloaded apps in Android Market. However, we didn’t expect to reach this first great milestone so soon! 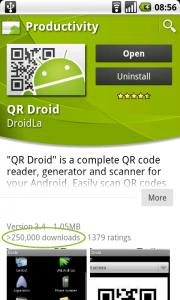 QR Droid has been downloaded more than 250.000 times in Android Market in 55 days! Almost all current most downloaded apps in Android Market required near one year to surpass this number, specially the ones made by new Android Market publishers, as we were. We want to thank you all for using QR Droid and, specially, for recommending it to your friends. Without that, it would be impossible to reach this threshold so fast, since we depend exclusively on this as our marketing system. As you know, “> 250.000 downloads” is the last level. 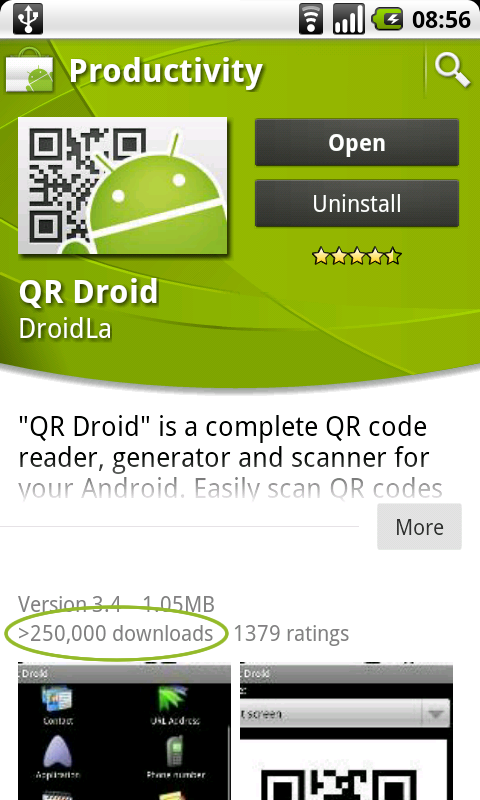 From here, Android Market will keep showing it no matter how many more downloads QR Droid has. We’ll be writing here in the QR Droid.com blog about any other major recognition the app receives going forward. I love your blog… is amazing as hell!